Approximately 100 people turned out for the first NDEW in Birmingham. The weather was perfect and attendees got to meet owners and EV enthusiast from local sponsors. We had a great time and enjoyed meeting new people and we are looking forward to next years event. We hope that local dealers met customers ready to convert to a EV emission free lifestyle. Birmingham City Councilors Sheila Tyson and Valerie Abbott will present 2 awards to area businesses who are leading efforts to expand electric vehicle infrastructure in metro Birmingham. All attendees will be entered in a raffle sponsored by Southern Research for Goal Zero Nomad 7 Solar Panel and Goal Zero Nomad 14 Plus Solar Panel (http://www.goalzero.com/solar-panels) to be called at 12:45pm by William J. Grieco, Phd, Vice President of Energy & Environment at Southern Research. 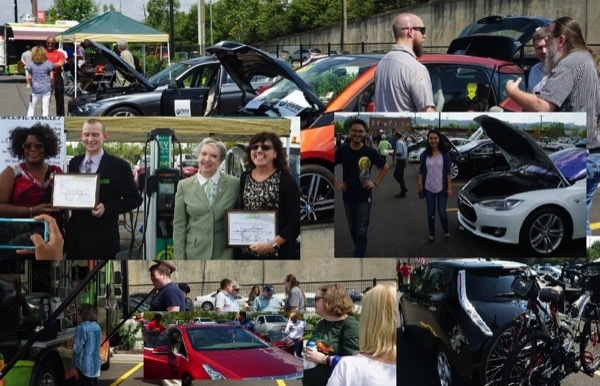 UAB is proud to Host the Birmingham National Drive Electric Week (NDEW) electric vehicle Showcase on September 15th from 11AM thru 2PM. The Showcase will take place on UAB’s Express Lot 4 (see map at https://www.uab.edu/map/?express-4) at 410 10th St S.
Vehicles on-site will include Nissan, Porsche, BMW, Tesla, Chevy, ZERO (motorcycles) and Ford plug-in and hybrid electric vehicles to name just a few! Knowledgeable enthusiasts from Alabama Power, the Alabama Clean Fuels Coalition, UAB Sustainability, and Zero Emissions Owners Group will be on hand to explain incentives and answer your questions. Meet owners of Electric Vehicles (EVs) and learn about EVs and EV Charging Stations. You can determine which model may best suit your personal or family needs. They are fun to drive, are less expensive and more convenient to fuel than gasoline vehicles, are better for the environment, promote local jobs, and reduce our dependence on foreign oil. Most models are even made in America in emissions-free factories. Many area food trucks will be on-hand so you can grab lunch and enjoy learning and asking questions about the newest in advanced technology vehicles. The event is open to the public and all are invited to attend. Ample parking is available on 10th St S and 5th Ave S. UAB students, faculty, and staff can take the Blazer Express from campus to Express lot 4. At 12:30pm, Birmingham City Councilors Sheila Tyson and Valerie Abbott will present 2 awards to area businesses who are leading efforts to expand electric vehicle infrastructure in metro Birmingham. Come visit and kick the tires at Birmingham’s NDEW vehicle Showcase on September 15th. See why electric vehicles are the fastest growing segment in the automotive industry! There are currently 137 attendees registered. Registered attendees report 787,167 electric miles driven.